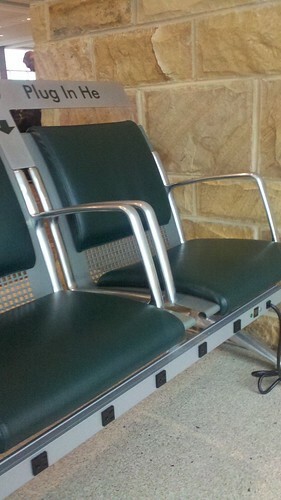 I'm was so excited to see the addition of charge chairs at my local airport. Finally, the airport has realized that happy passengers are those that can charge their laptops and iPads before jumping on a flight. The only addition I would make would be a side table or flip table to set the charging device, but beggar's can't be choosers here. I also want to give a shout out to La Guardia Airport which has stepped up their game and as part of recent renovations around Concourse A has added a hip seating and charging area (pictures to come). I applaud the smart airports that have figured out that passengers that don't have to spend their time searching for an outlet and a seat near it, are happier customers.